Escape into the remote Empty Quarter and lose yourself to nature's majesty. Our Liwa desert resort is a 90-minute drive or 50-minute helicopter ride from downtown Abu Dhabi. From Dubai, head towards Abu Dhabi using the E11 (Sheikh Zayed Road). Once you pass Al Rahba City and Al Rahba Hospital, take the exit at Shahama signposted for Saudi Arabia/Tarif/Al Ghweifat (going up the bridge) and keep following the E11 road. From Abu Dhabi, drivers head to the E11 in the direction of Mussafah/Tarif/Mirfa. Continue on the E11, and after approximately 15 km, exit the highway (exit 305 to Hameem). Take the third exit at the first roundabout, and the second exit at the next roundabout (to Hameem) on the E65 road. You will pass the Car Museum on your left. Keep straight on this road for approximately 154 km. Once you reach Hameem, look out for the fuel station on the left and proceed to the second U-turn, where the resort will be signposted. Once you have made the U-turn, take the first right through the gates. 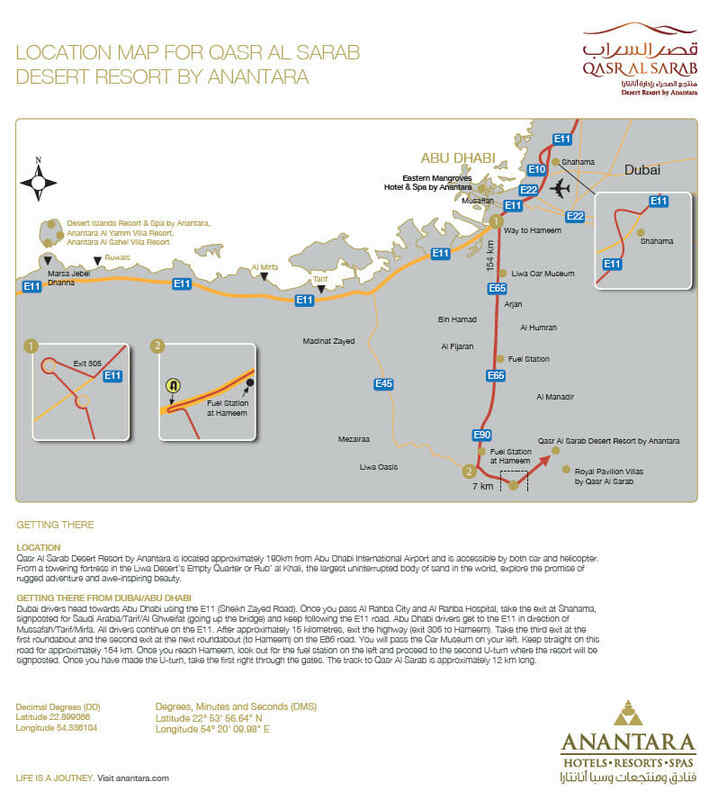 The track to Qasr Al Sarab is approximately 12 km long. For airport transfers to and from Qasr Al Sarab Desert Resort by Anantara, please call +971 (0)2 886 2088 or email conciergeqas@anantara.com. For your added convenience, a number of our vehicles now feature complimentary WiFi. Soar over the Empty Quarter’s spectacular dunes with a private helicopter journey that takes approximately 50 minutes from Abu Dhabi International Airport and 75 minutes from Dubai.